Representative Honours: Northern Ireland: 8 Full Caps (1962-1965), 1 Under-23 Cap (1963), 2 Schoolboy Caps (1957-1958); Irish League: 5 Caps (1962-1963). Club Honours: (with Linfield) Irish League Champion; Irish Cup Winner 1959/60, 1961/92, 1962/63, Runner-Up 1960/61; City Cup Winner; Gold Cup Winner; Ulster Cup Winner; Co. Antrim Shield Winner; North-South Cup Winner 1961/62; (with Stoke) Football League Cup Runner-Up 1963/64; (with Telford) FA Trophy Winner 1970/71, Runner-Up 1969/70. Signed by Linfield in 1957 from Carrick Tech, Bobby Irvine was later joined at Windsor Park by younger brother and future international colleague, Willie. Established in the Linfield firstteam at sixteen, he also served his time as an apprentice engineer. Goalkeeper in Linfield’s earliest European adventures, in September 1959 he finished on the end of a 7-3 aggregate defeat to Gothenburg in the European Champions Cup. 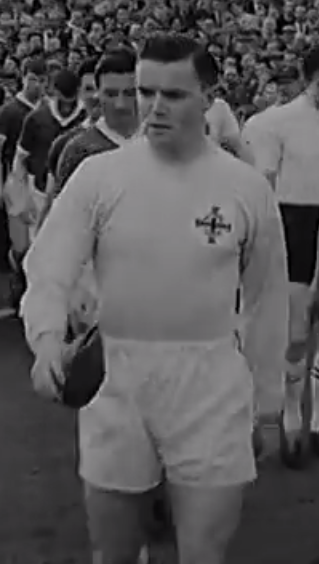 Although Irvine found disfavour with the Linfield selection committee during the 1960/61 season, at one stage it seemed he would be released, he survived and was a virtual ever-present in the 1961/62 “clean-sweep” campaign winning Irish League, Irish Cup, City Cup, Gold Cup, Ulster Cup, Co. Antrim Shield and North-South Cup winner’s medals. 1962 also brought Irvine his first senior representative honours. He kept goal twice for the Irish League in the closing months of the season in a 6-2 win over the Italian Semi-Pro League and in a 3-1 victory against the League of Ireland. In May 1962 he made the first of seven consecutive appearances for Northern Ireland - replacing the perennially injured Harry Gregg - as they suffered a shock 4-0 defeat to the Netherlands in Rotterdam. Through the 1962/63 campaign, Irvine added further Irish Cup and Co. Antrim Shield winner’s medals and three further Irish League caps to his collection. In February he played in the same side as younger brother Willie for the first time since their schooldays, Northern Ireland Under-23s suffering a 5-1 defeat by their Welsh counterparts. A little over a month later the pair lined-up together again for a Full international, Wales again running out comfortable winners in a Home Nations tie. In June 1963 Bobby Irvine was transferred to Stoke City for £6,000. He made his debut in the opening game of the season, a 2-1 First Division defeat of Spurs, but lost his place after seven games to another new arrival at the Potteries, Lawrie Leslie. He remained out of the side for most of the season, only returning to the first eleven in April, taking his total League appearances for the season to eleven, and picking up a League Cup runners-up medal with an appearance in a 3-2 defeat by Leicester in the Second Leg of the Final. 1964/65 brought Irvine a single League appearance, and his eighth and final international cap – unhappily on the end of a 5-0 stuffing by Wales in Belfast. Back in the Stoke team mid-way through the 1965/66 season, Irvine was given the honour of captaining the team in a League Cup tie against Burnley, with the Lancashire team led out by brother Willie as the two clubs agreed to take part in something of a publicity stunt. Bobby came out on-top in the first match, a 0-0 draw, but Willie had the last laugh, scoring in a 2-1 replay victory. Irvine’s career at the Victoria Ground was brought to a premature end by a rush of blood in the FA Cup Third Round. Facing Walsall at home, Irvine was guilty of giving away a penalty which helped the Third Division side to a 2-0 win. Furious with Irvine’s antics, Potters’ manager, Tony Waddington never picked him again, and come the summer he was released to sign for non-League Altrincham. Having had his Football League career ended at just 24, Irvine would return to the limelight in the early-1970s. 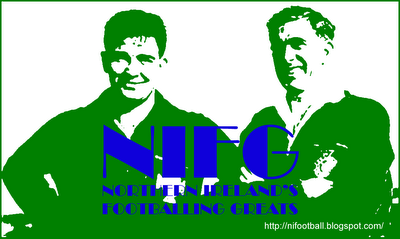 With the newly-named Telford United he played in consecutive FA Trophy Finals at Wembley Stadium. In 1970 28,000 watched Macclesfield triumph 2-0 over the Bucks in the FA Trophy but the following a year a slightly larger crowd saw Irvine concede twice but still come out a winner as Telford defeated Hillingdon 3-2. Summary: 8/0. Won 2, Drew 1, Lost 5. As a young man of 21 in 1963 when Bobby joined Stoke,I was in the Boothern End for most of his games & became a fan of for life. On August 14th 2010 my wife & I were invited to our neighbours (Bobby's nephew) re-affirmation of their marriage vows service. I never imagined that I would meet up with Booby. During the reception feast, we had an entertaining hour discussing the 'Potters' & all things Stoke. Bobby was and still is a true & modest gentleman. As a young lad growing up watching Telford FC , Bobby was a true hero to the group of us who always stood behind his goal , a character and legend always gave 120% no matter what , thanks Bobby. Being big Stoke fan I was pleased to make Bobby a friend during that period.He was of course a Stoke keeper and we mated up during the rest of his stay with us.We played some darts at my local and he was a smashing bloke it was unfortunate the way he left but it wasnt all down to him.Hope he is well.